If you are looking for superb sound output and comfort of use, go for the Numark HF125 supra-aural headphones which offer all of the above features and more, in an economical package. These Numark headphones fit snugly over your ears for delivering an excellent listening experience, that's to their adjustable ear-cups. Moreover, the side-bands of these supra-aural headphones feature 7-stage adjustment which ensures a comfortable fit for any type of user. Furthermore, these Numark headphones offer loud sound output and a deep bass, which makes it ideal for DJs. So if you want to upgrade to headphones with a robust build quality, the Numark HF125 is certainly worth a try. Efficient headphones at amazing price. Ideal for keyboard use. Thanks for adding your comment about the Numark HF125 DJ Headphones you recently purchased from us, Laurence! The Simply Sound and Lighting team will be really pleased that you're so happy with your item! 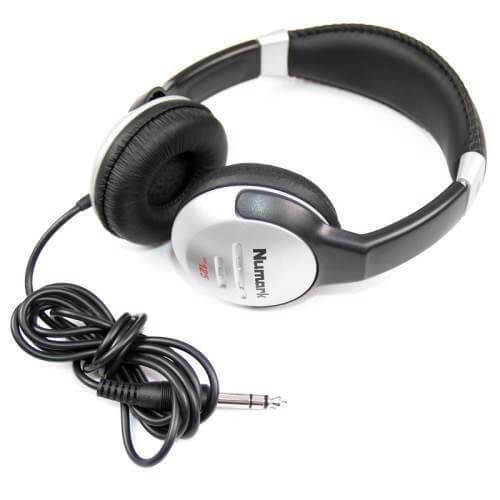 These headphones are a good value item that I purchased for my Laptop and Desktop. For the very good price they give a decent sound and are reasonably comfortable to wear. Thanks for letting us know you're happy with your new Numark HF125 Headphones, Julie. Everyone at Simply Sound and Lighting will be pleased to hear about your feedback!